When you are traveling on the road, we all know that it can be hard to keep your car clean. If you ever end up with a bunch of smashed bugs smeared on the windshield, it can be annoying and obscure your view at the same time. 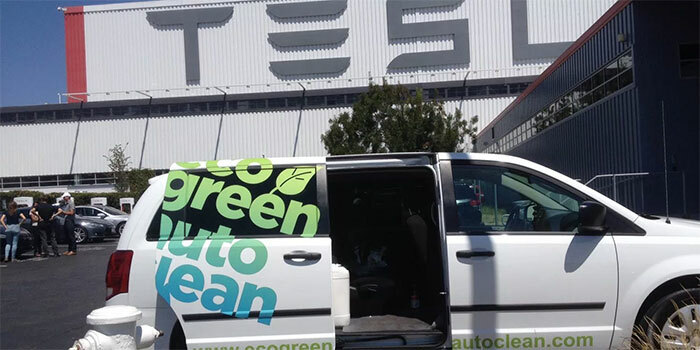 Tesla is working with a green car cleaning service that can set up shop at its Supercharger locations and clean your car for you while you charge up. The service is called Eco Green Auto Clean. The big claim here from the wash company is that it can wash your entire car using only a single cup of water. If you are environmentally conscious enough to be driving an electric car, saving water is likely a big deal to you as well. Eco Auto Clean uses microfiber towels, biodegradable auto wash spray, and the single cup of water. The company claims to use a solution that lifts and dissolves dirt on contact. Tesla is testing the service now with employees at the Fremont Factory Supercharger. The cleaning service would be subscription based at around $80 monthly or the Model S and would allow you to get the vehicle washed twice per month.